Season 50 Of Mybroga Coming Soon!! Mybroga is starting its 50th season. YES 50 !!! So, our idea was to celebrate it with a CLASSIC Papy tracks + Original 1967 F1 cars combo in the division A and honour modders with the 1965 mod for Division B. Divisions will race at tuesdays (B ) and wednesdays (A) nights. (1) Each chassis can be used as much as in two races. In the Div. B the chassis is free but fixed along the season. 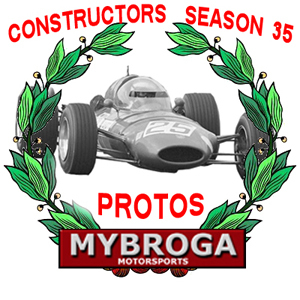 We're also in Facebook as "Mybroga (Grand Prix Legends)"
We still have some slots, especially in the B.
Edited by mcmirande, 08 February 2018 - 06:46 AM.